Are you thinking about organizing a team building event for your team but not sure what to look for or where to start? How do you select one company over another? What makes one company better than another? How do you know the company you choose will fulfill your requirements and meet your needs? Think Team Building Activities Melbourne. We will fulfill your requirements and meet your needs and here’s why! Urban Quest Team Building Events is like any other training course or session that you have been on. A pre-course questionnaire should be completed together with an evaluation process upon completion. Team Building Activities Melbourne carried out by Urban Quest Real Life Games focus’ on the long-term strategic plan for your company and your team. Team building is not just a one-off event but a series of regular quarterly activities that address different values and therefore meet different objectives. Prior to the completion of any Team Building Activities Melbourne, a pre-screening is carried out in order to fully understand what your current challenges and issues are and what you are hoping to achieve from the activity. The pre-screening is carried out for each individual as well as the team as a whole. This is because team members will have their own individual issues that are likely to be impacting on the performance of the team and therefore these also need to be addressed. The information gathered from the pre-screening helps to prioritize the objectives required to be met and achieved from the Team Building Activities Melbourne. There is a debriefing session held following the completion of Team Building Activities Melbourne. This is a vital part of any training completed as it is important to assess whether the needs and objectives of the activity have been met by both the company and the individual. Did Urban Quest Real Life Games as a service provider meet your objectives and did you as a company and a team, achieve what you set out to do? It is important that every team member participates in the debriefing session in order to understand what they got out of the event but also to understand what new found skills or knowledge they have and shall take back to the workplace. Think Team Building Activities Melbourne. The statistics and data gathered throughout Urban Quest Team Building Events, following the completion of the event, is processed and turned into performance reports. These results are discussed as part of the debriefing session. The reports provide both qualitative and quantitative data, which can be stored and reviewed again prior to the next event. Think Team Building Activities Melbourne. 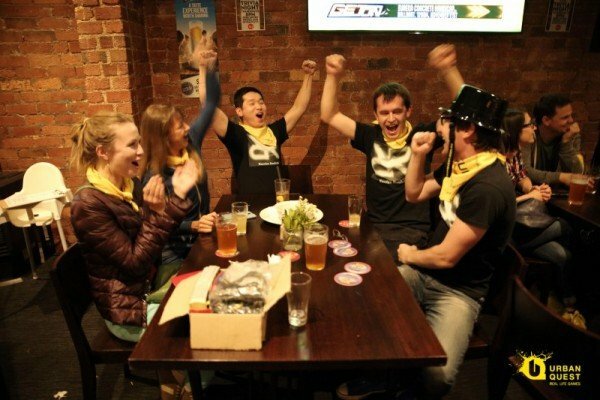 Team Building Activities Melbourne are most effective when individuals can partake in a competition, have fun and be part of it. Anything is possible with a little help from your friends here at Urban Quest, who are well versed in Team Building Activities Melbourne.